Ever find yourself getting ready to play an unfamiliar song in DDR and not know what speed mod to use? Some charts in the game have a bunch of speed changes that may force you into reading a faster or slower speed. 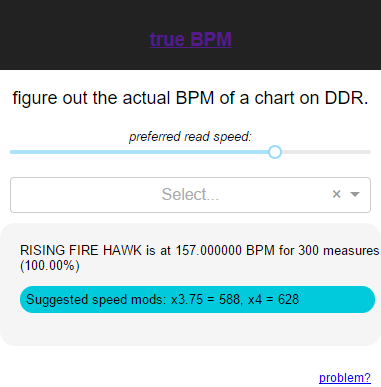 Instead of whipping out the calculator or making a total guess, you can use a web app named true BPM to find the right speed mod for you for any song in DDR. 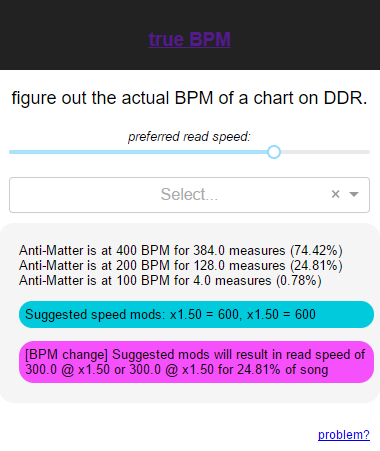 With true BPM, all you need to do is select your preferred reading speed, and then pick a song. true BPM will do all the heavy lifting for you to pick out the ideal speed mods for the song you are about to play. 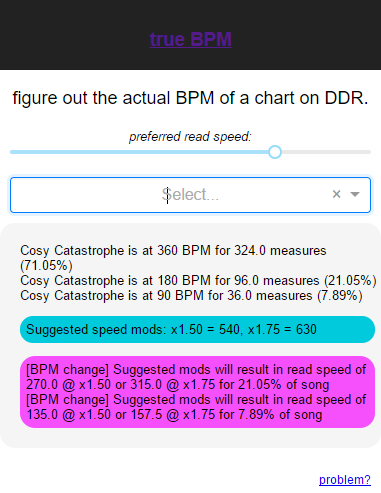 The app will analyze the BPM of the selected song and indicate any speed changes in the chart there may be, and for how many measures it maintains that BPM. It even shows a percentage that indicates how much of the song is played at the specified BPM. And the app is designed to be mobile-friendly — perfect for figuring out your speed mods right before playing or even in between picking songs.